If you want to try Singapore hawker food but nothing too exotic, Cantonese roasted meat is the perfect introduction. For only a few dollars, you get a complete meal with rice, soup and your choice of roasted duck, pork or chicken. The stalls are easy to identify too — just look for the display of crispy cooked animals hanging in the window! Chickens, pigs and ducks — take your pick! Although this style of roasted meat is common in Singapore, Malaysia and even Thailand, it is still called Cantonese roast meat or Hong Kong roast meat, in recognition of the area of South China where the technique was perfected. The meat is rubbed with herbs like Chinese five spice (star anise, cloves, cinnamon, peppers and fennel) and slowly roasted. Roast meat stalls usually offer the option of chicken, duck or pork served with rice. If you can’t choose, most also offer a combination plate with two meats. Roast chicken differs from Hainanese chicken rice, which is practically the national dish of Singapore, because the meat is roasted and not steamed, but it is served with sides of sliced cucumber and chilli sauce. Roast duck is not the same as Peking duck, but is delicious with crispy skin, lean meat and a side of sweet soy sauce for dipping. 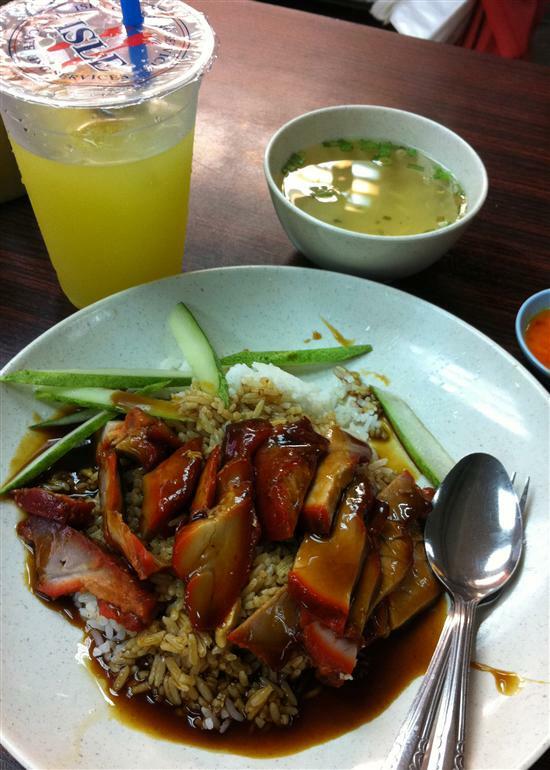 Char siew pork and lime juice — a complete meal for just S$4.20. If you’re in the mood for pork, there are two options: roast pork and char siew. Roast pork is made from pork belly and also known as three-layer pork because there’s a layer of crispy skin, a layer of pure fat and a layer of meat. Char siew is leaner (as far as pork goes) and marinated with hoisin sauce and honey, which gives it a sweet taste and a bright red colour. Char siew is also used as a filling in steamed Chinese buns called bao. After you’ve selected your meat, the hawker will take it down from the display and start chopping, Roast meat is usually served with white rice, but sometimes noodles are also an option. While the meat should be rich and flavourful on its own, if you need more zing there’s a selection of condiments you can help yourself to, including a sweet thickened soy sauce and chilli garlic sauce. Fatty Cheong Roasted Pork: Stall #01-120 ABC Brickworks Food Market & Food Centre, open 11:00–20:00, closed Thursdays. Lee Hong Kee Cantonese Roast Duck: Stall #01-60 Tiong Bahru Market & Food Centre, open 09:00–19:00, closed Thursdays. 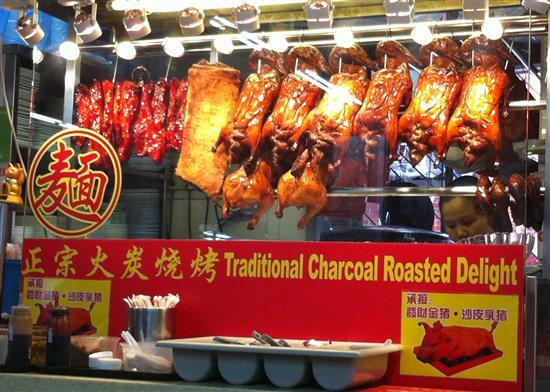 Lee Kheong Roasted Delicacy: Stall #02-15 Hong Lim Market & Food Centre, open 10:00–18:00, closed Sundays.